Top Drives Racing Game cars for Game lover, Think you know your cars? 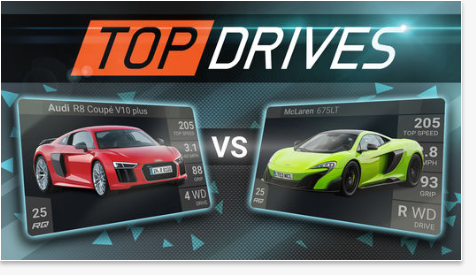 It’s time to put your knowledge to the test in Top Drives – the only automotive card collection game on the App Store. BUILD THE PERFECT RACING DECK from over 700 officially licensed cars. COMPETE FOR EXCLUSIVE CARS in live multiplayer events. Why is Top Drives the ultimate mobile experience for every car enthusiast? – Marques, McLaren, Bugatti, Pagani, Ford, Mercedes much more. – Car stats sourced from Evo Magazine making this the ultimate bench racing tool. – Manage and upgrade your cars – tune them how you want. – Weather effects and multiple surface types. – Addictive racing strategy gameplay. Top Drives is free to play offers some optional in-game items that can be purchased for real money. Top Drives is an online game and requires a persistent internet connection to play.